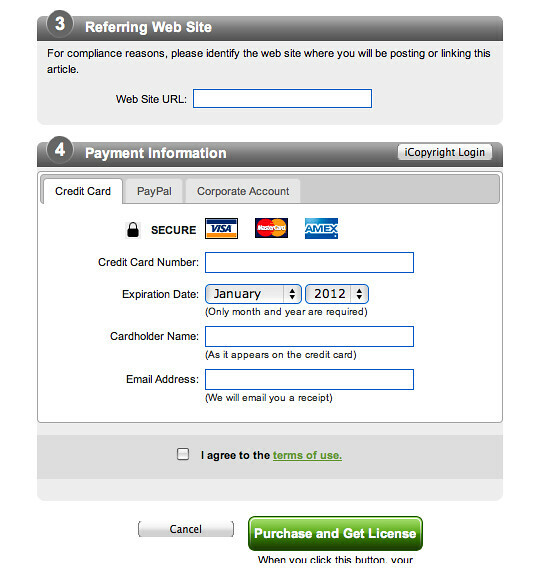 The “Do I need a License…” line actually ended with a link to Fair Use Statement: Do I need a license to republish an excerpt from this article?. iCopyright provides a comprehensive suite of services to publishers to help them protect, promote and profit from their content. … With one simple implementation of the iCopyright tag, publishers may take advantage of all of these services. No other content licensing solution comes close to matching the iCopyright platform. Designed to discourage individuals and organizations from using your content without permission, or exceeding the terms of their original license, iCopyright’s peer-policing and license authentication feature allows those who receive content to know whether a proper license has been obtained. People won’t pirate your content if anyone can verify whether it is an authorized copy. The Feed & Tag Syndication service enables you to license feeds of your own copyrighted content to other publishers, bloggers and websites — instantly! Your iCopyright toolbar and licensing services are embedded in the feed of your content when displayed on subscribing web sites. 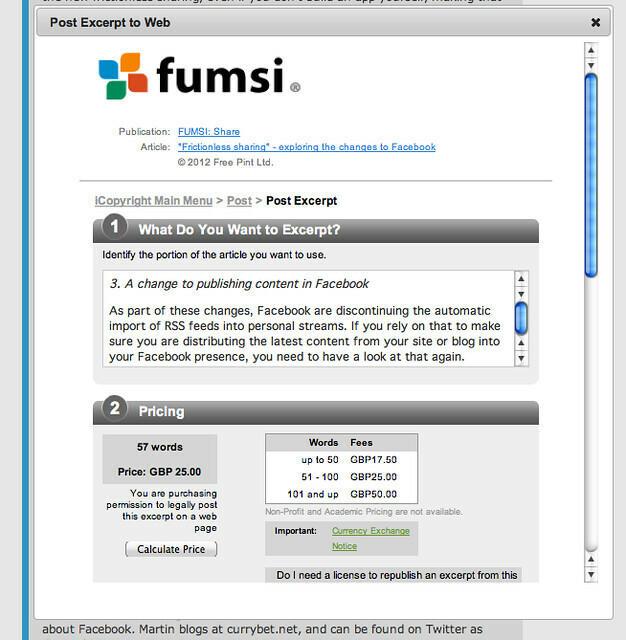 You earn new revenue for each page view and share in all secondary uses according to terms you specify. Similarly, you can obtain a licensed feed of content from other publishers in the iCopyright network to enhance your own original content. And, of course, you earn a revenue share on all licensed reuses of that content on your site. Tag-Only Syndication allows you to add iCopyright tags to content you license from third-party content producers who may or may not be in the iCopyright network. Similarly, it allows you to authorize and manage the tagging of your copyrighted content when it appears on third-party sites, such as aggregators and research databases. In other news, a press release that’s being rehashed* over various media blogs today announces Newsright, a platform for licensing and tracking the (re)use of online (textual?) news content. According to the Washington Post take on the story (AP, NYTimes, McClatchy, others launch NewsRight online rights clearinghouse), Newsright appears to build an tracking system based around the NewsRegistry [FAQ] launched by AP a couple of years or so ago (here’s a report from the time (July 2009): AP takes action on copyright breaches with new tracking system; The NewsRegistry was based around the hNews microformat, I think? (Ref: No Need for Violence in Microformat War Between hNews, rNews)). Certainly, if you go to the NewsRegistry site today you get quickly led to Newsright. So why’s this interesting in online education sense? Tracking. Having released open educational resources onto the web, folk are now getting worried about impact (i.e. one of those forms of return on investment you can use when there isn’t obviously a direct return on the bottom line). I don’t really have much clue about what impact is or is supposed to be, or how it is supposed to be measured (nor, I think, does anyone else), but tracking seems to be one of the gut reaction responses. Which is why the approach taken by Newsright may be of interest to folk wanting to track direct reuse of things like open educational resources. (For a summary of approaches and technical solutions that have been explored to date, see the JISC/CETIS wiki: Tracking OERs: Technical Approaches to Usage Monitoring for UKOER, the RAPTOR e-resource log analysis toolkit, and JISC’s latest favourite toy in the area, the Learning Registry [press release; I haven’t really paid much attention to this, so don’t really know what it’s all about. Based on this early review (JISC Learning Registry Node Experiment it’s a database that will aggregate metadata and usage and tracking data (the Learning Registry folk call that “paradata”, I think? I guess you get way more budget for coining a neologism than you do an acronym?!) that other people have figured out how to collect (“The Learning Registry itself is not a search engine, a repository, or a registry in the conventional sense. Instead the project aims to produce a core transport network infrastructure and will rely on the community to develop their own discovery tools and services, such as search engines, community portals, recommender systems, on top of this infrastructure. Dan commented: ‘We assume some smart people will do some interesting (and unanticipated) things with the timeline data stream.’ The Learning Registry infrastructure is built on couchDb, a noSQL style ‘document oriented database’ providing a RESTful JSON API.”))]). And finally… This post started with a look at the ways of policing copyright of text in an online setting. We all know that the current copyright laws aren’t particularly suited to the digital context, so it’s perhaps refreshing that they’re under review. In the UK, the Intellectual Property Office are currently running a consultation around copyright (Consultation on proposals to change the UK’s copyright system). The consultation was launched on December 14th, 2011, and runs until March 21st, 2012, so you still have plenty of time to respond;-) A good starting point may well be Extending Copyright Exceptions for Educational Use [PDF]. Very helpful Tony – on various fronts we’re thinking about at present. Not so much the monetisation but about we might use such mechanisms to ensure users abide by/are aware of OER licensing terms and for tracking where used.